The ultimate guide and souvenir. 439 gorgeous color photographs and 23 marvelous historical images from more than 60 top photographers. 100 pages worth. But there is also a fascinating text by David Lansing, travel author and writer for Sunset, National Geographic, and the Times of Orange County. And unique maps of the County and its position as the Center of Southern California. And vital statistics. And a guide to county parks and beaches. And a list of recommended destinations. And visitor information resources. All in high-quality, state-of-the-art printing. 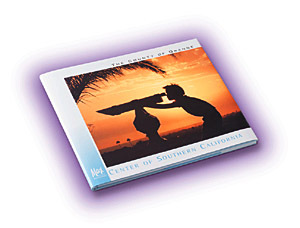 The County of Orange, Center of Southern California, takes you on a narrated visual trip- a Visual Monograph -through an unsurpassed array of natural beauty, refreshing lifestyles and engaging attractions. Available at your hotel, local bookstores, gift shops, merchants, attractions, or order direct from the publisher-in both softcover ($19.95) and hardcover ($37.95). You'll get the total picture. And that's something you can book on!